Spanish furniture line is considered by many as the most distinctive and elegant. Hand made with rich wood moldings and a fine rustic dental detail just bellow moldings, handmade wrought forged iron drawer pulls. All drawers are on Full Extension glides. Mission furniture Mission Style Furniture also known as Shaker furniture: Most customers re-order this Mission furniture line more then the Spanish or Mexican furniture lines, this line of furnishings cost a fraction more because of the extra time involved to make visible dovetail drawers and mortise joinery. The general appearance of this line is soft, clean and elegant, We offer this line in solid Oak wood, the wood grain is just beautiful and get appreciated perfectly in this Collection. Any other piece of furniture in any other line can be made with these characteristics any size any configuration. This is by far the best selling line of furniture as well as the best known throughout the world. The contrast of the wrought iron hinges, clavos and door pulls against the soft vintage honey color of the pine, makes a delightful impression. Walnut stained solid pine under dark rust iron hinges protected with a coat of clear matte polyurethane is gently discreet, “thee classic furniture style for Spanish or Mediterranean architecture homes, other companies try to imitate our furniture quality with no avail, each of our furnishings is handmade by the assigned carpenter team. Our pieces are unique. choice of wood species, fabrics, carvings, leathers, finishes... etc. It is all about what you want. All our furniture is assembled ready to use, kiln dried sugar pine from Washington, Oregon and Canada. Our furniture is genuinely made in Mexico, not China, although they make many other very fine things. Great pine smell and furniture grade wood. All our furniture is made to customer’s specifications. Minimal size alterations at no extra cost. We do not pre-fabricate avoiding termite infestation in warehouses or containers. All our drawers are on quiet Steel Full Extension Glides, choice of colors at no extra cost as of Spring 2013. fine Mexican furniture by Hacienda Rustica manufacturing Mexico’s finest since 1946. custom furniture open to the public you may order directly we make mexican furniture only we do not sell accessories look for our custom doors. We use U.S. kiln dried sugar pine, mahogany, alder, maple, oak, mesquite, cedar etc. not ponderosa pine or tropical pine. each piece of furniture is made on demand, we do not contribute to the forest destruction of Michoacán, Chihuahua, Durango etc. Our wood source is in U.S. and Canada where Alder, Oak, Sugar Pine is within cut/grow U.S./Canada standards,kiln dried enough to avoid zap and termite infection, creating furniture in the Mexican rustic style with renewable resources is what we are all about. The charm of this line lies in the natural irregularities of the wood in the furniture, like the knots, the bow, the uneven areas that make the stain penetrate unevenly, these are the characteristics of rustic furniture. During the late 1500’s, Europeans, Italians but mostly Spanish artisans and skilled carpenters invaded the pre-existing native cultures of furniture making, bringing with them the guild system establishing the first carpenter’s guild in Mexico City in 1568. As a result, Mexican furniture manufacturing began. 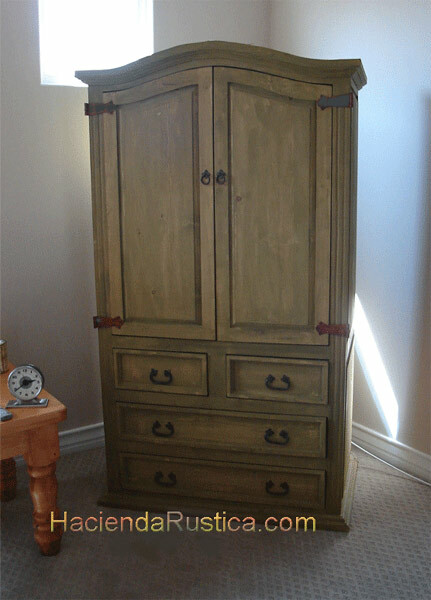 The variety of beautiful and creative furnishings has not ceased, though there are many of the classic styles as you can see in our online catalog, new models are constantly being made and we do listen to customers who have great suggestions like putting glides on all drawers in 1994. In 2013 all our drawers in our Mexican, Spanish and Sierra furniture collections are in Steel Full Extension glides at the same low price. You may also select from a variety of wrought iron hardware that we have made for dozens of years with the old Mexican tradition of forged wrought iron hinges, clavos, door pull, locks, keys, corner braces ornamental hardware for the massive wood used in Mexican hacienda furniture, not only makes a beautiful and unique addition to any home, but also tells a story of the societal, cultural and religious history of furniture manufacturers of Mexico. All items in the Mexican furniture Rustica Pine Collection are handcrafted, the pine wood used in our furniture is 100% constructed entirely of solid American Sugar Pine cut and processed in Oregon and Washington U.S.A. this creates job in US and Canada on a renewable resource. We also make furniture in other wood species, according to customers furniture request. The exterior surfaces are intentionally distressed to achieve that Mexican rustic vintage finish people look for in this very charming style of furniture. The pine is then stained and finished with a protective coating of wax applied by hand. We do not use veneers! MDF nor formaldehyde products on our Mexican furniture. We use only natural solid wood. Other choices in furniture today, are made with MDF materials or Particle Boards with light paper or wood veneers, hiding edges with wood moldings. We do not store furniture in warehouses nor containers, avoiding termite infestation. Every furnishing is made on order. We do not deceive our clients. Our wood is 100% from U.S. sustainable sources. Our furniture and doors are genuinely manufactured in Mexico, as it should be for this honest title “Mexican furniture”. How can we help you improve your home?